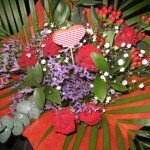 Jacaranda Florist will be delivering all day on Valentines Day but please place your order as early as possible. Due to the vast amount of deliveries on this day we cannot specify a certain time as all orders placed are gathered together into routes the night before, therefore making it impossible to give a time slot. All flowers ordered will be delivered from 9.00 am onward and we always try to get them delivered as quickly as possible with all our helpers on board. ONLY AFTERNOON AVAILABLE NOW. No flowers go out by courier or by taxis and are all delivered in our own jacaranda van or our own vehicles. Unlike internet companies we guarantee to give you the best flowers and excellent service with a smile! We deliver the WOW Factor everytime and have been trading for nearly 17 years. We deliver to Leigh and all surrounding areas (see our delivery page) for more details. This is a photo of our Avalanche (cream) and Naomi Red Roses. Long stemmed roses tried and tested for their freshness and superb quality. We have been using these for the past 17 years. 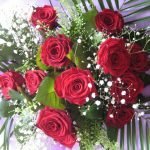 WE CAN ALSO ARRANGE TO SEND FLOWERS THROUGHOUT THE UK AND OVERSEAS BUT PLACE YOUR ORDER IN ADVANCE. You can place your order directly on our Online page which takes you to a secure page powered by Direct2Florist but the orders will still be made by Jacaranda and delivered by us. Alternatively call us 01942 606666 or Facebook message or Email us. Emails will be answered even when we are closed for the day. Open till 7pm for all your orders. 12 Red Naomi long stemmed red roses with gypsy, surrounded by lush foliage all presented in a hand tied bouquet in a red box in water. We even add a little Valentine pick to the design. Free Leigh Delivery! 6 long stemmed Red Naomi Roses with gypsy or statice and hypericum and surrounded by lush foliage presented in a hand tied bouquet in water in a red box. We even add on a little Valentine Pick. Free Leigh Delivery! Show them you care this Valentine’s Day by sending a little bag of love. A mixed selection of fresh flowers with a single red rose in the centre. Arranged in water with gift wrap in a bag. 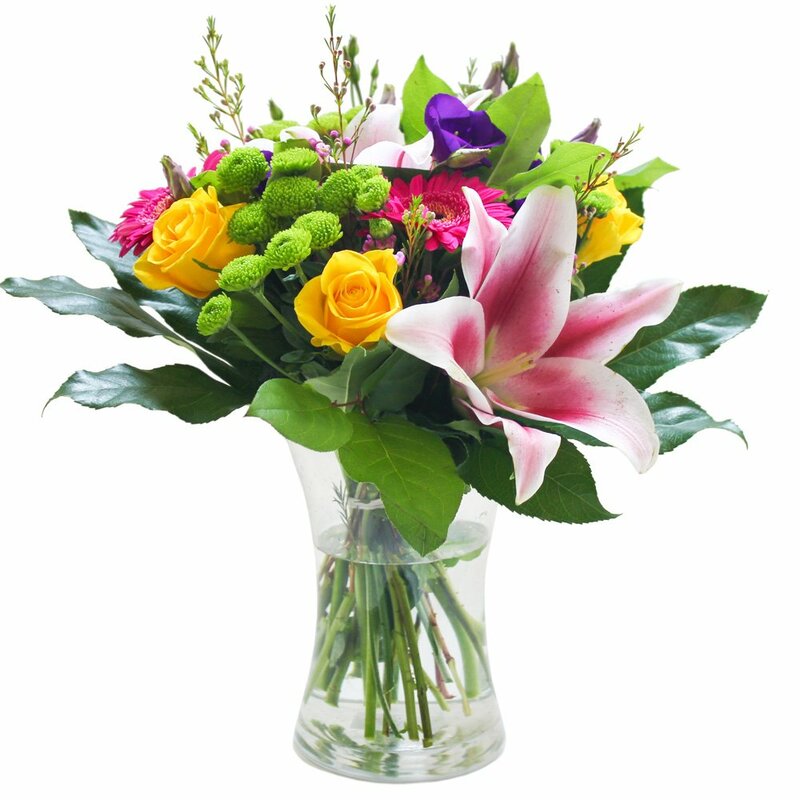 Let us choose the flowers and arrange in a glass vase with foliage. This design comes gift wrapped with valentine cellophane. No red roses are in the design. A perfect gift this Valentines Day. A single red rose surrounded by gypsy and foliage and placed in a bud vase. A simple design that says I Love You! OPEN FROM 8.00 AM UNTIL 7PM FOR YOUR ORDERS BUT SEND US A FACEBOOK MESSAGE OR EMAIL IF YOU HAVE MISSED US. Two red roses representing a token of your love to theirs. A timeless romantic classic. Arranged in a small container. Order early for this design. If the one you love prefers pinks and whites instead of reds then choose this design. A wonderful array of bright pinks, white and foliage all arranged in a pink gift box in water. 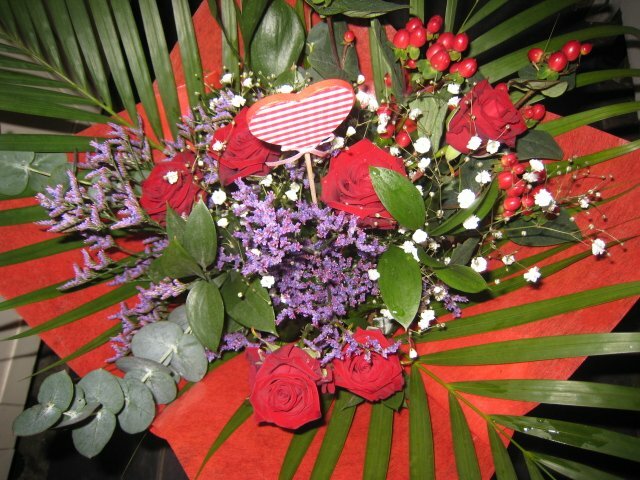 A mixed bouquet of fresh flowers including reds and foliage all arranged in a hand tied bouquet and placed in water in a red gift box with valentine wrapping. No Red Roses are in this design. 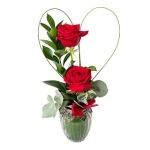 Spend £30.00 or above and get a red rose in the centre. 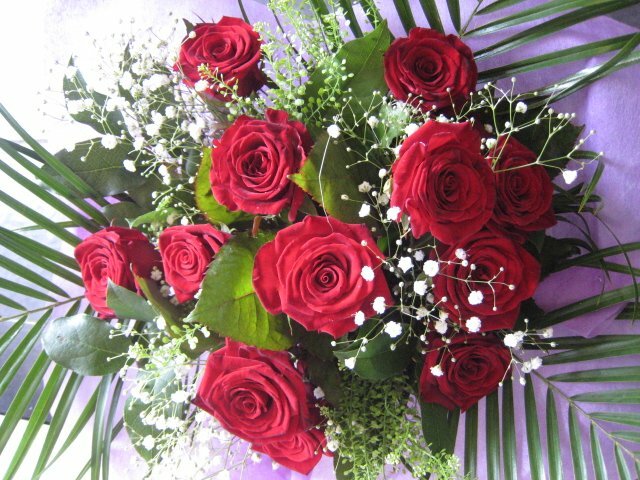 6 or 12 long stemmed red roses arranged with gypsy and foliage in a valentine cellophane wrap. This bouquet need to be placed in water with the flower food provided on receipt. Cant decide then give us a call we are here to help you! Open till 7pm every day! A timeless classic of rich lime green shamrocks and white oriental lilies surrounded by avalanche roses and white seasonal flowers and foliage. 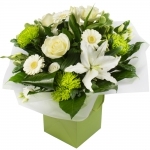 This design is arranged as hand tied in water in a cream gift box. Just a few verses for you…..
Sending Valentine Wishes wrapped with Love and Kisses…..
Today’s the day for me to say I love you more in every way. Happy Valentine’s Day! Jacaranda For . . .
Search Jacaranda . . . Copyright © Jacaranda Flowers. All rights reserved.